Cyanoacrylate adhesive, Gap Filling Formula. Medium viscosity. Allow approx. 7-10 seconds for part positioning. Average 20 seconds cure time. Use Zip Kicker to accelerate cure time. Works well on harder woods such as Bass and Spruce, even works on oily surfaces! Some uses besides hobbies and crafts include; jewelry manufacturing and repair, taxidermy, pool cue tips, darts, archery, knife making, mold and pattern making, furniture refinishing and antique repair, and for fishing, fly line splicing and fly tying. 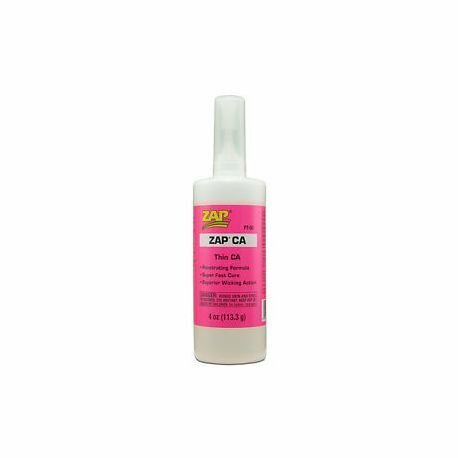 Wood turners and manufactures of custom wood products appreciate the ability of ZAP-A-GAP CA+ to help save their projects by filling in and bonding cracks that often occur in expensive hard woods. Allows 7 to 10 seconds for positioning. Accelerate the cure with Zip Kicker. Works best on: Aluminum, Ceramic, Leather, Metal, Most Plastics, Pottery, Rubber, Veneer and Wood.